This is some of the worst movie related news I've heard in quite a while. Due to continuing delays in the production, Guillermo del Toro has withdrawn from directing The Hobbit. When it was officially announced that Peter Jackson would not be filming the LOTR prequel (or in the film version's case prequels) I was disappointed but not surprised considering all of the financial issues that arose post LOTR. Then I was excited when they announced that Guillermo del Toro would take Jackson's place at the helm of The Hobbit. His work on films such as Pan's Labyrith, the Hellboy films, and to a lesser extent Blade II really showed off his amazing imagination, style and design creation that made him a perfect fit to adapt further stories from J.R.R. Tolkien's Middle Earth. Shrek Forever After (2010), PG, 93 minutes - The fourth and supposedly final installment in the Shrek franchise focuses on Shrek's life after the events of Shrek the Third. On the day of his children's first birthday we find Shrek having a bit of a mid-life crisis. He loves his family but misses the days when he could do what he wanted, when he wanted, and not be interrupted or distracted. Enter Rumpelstiltskin. He offers to trade Shrek one day like the day he craves so much in exchange for one day from Shrek's childhood that he can't even remember. Shrek thinks this is a good deal and signs Rumpelstiltskin's contract. He then falls into an alternate universe where he never married Fiona, doesn't know Donkey, and can go about his life as a scary old ogre. 1) an old college friend Kerri (check out her book blog here) both highly recommended the book and thought I should go ahead and see the movie first (this was a good call, as I'm not the world's fastest reader). 2) the Grandin Theatre, which is about a mile down the road (and the only theater around that ever screens such foreign films) began showing it this weekend. 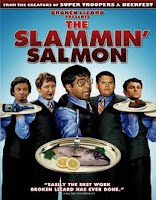 The Slammin' Salmon (2009), R, 90 minutes - The Slammin' Salmon is brought to us by Broken Lizard - the same group that provided us with Super Troopers and Beerfest. While not being as movie quote friendly as either of those two, it is a pretty entertaining restaurant based comedy. Robin Hood (2010), PG-13, 140 minutes - The latest Ridley Scott/Russell Crowe collaboration is not the Robin Hood story we've all grown up with. Instead it's an alt continuity story of how Robin Hood became the outlaw that robs from the rich and steals from the poor that we are all familiar with. When you get right down to it, Ridley Scott's version is a prequel that mixes up character's histories while they still filling the same roles within the story. MarvelMasterworks.com - I came across this link today while I was trying to look up the actual release date for the Brubaker/Lark Daredevil Vol. 2 Omnibus (was 5/5/10, is now 6/3/10) and figured I'd share it with those of you who also have an inner comic book nerd. It's not just a list of all of the Omnibus releases from Marvel, it's also a list of all of the printings and variants that have been available. It also provides links to various retail locations (i.e. Tales of Wonder and Amazon) from which these great collections can still be purchased. Iron Man 2 (2010), PG-13, 124 minutes - Iron Man 2 kicks off the 2010 summer movie schedule with a bang. It's bigger, louder, wittier, and more action filled than the original. Version 1.0 however, is still the superior story. Robert Downey Jr retains his role as Tony Stark/Iron Man in a film that sees the character struggle with even greater levels of fame (after his admission of being Iron Man at the end of the first film) and deteriorating health (his body has an adverse effect to the element powering the arc reactor in his chest), while trying to stave off a new threat to his 'privatized world peace'. Downey Jr continues to be the perfect embodiment of Tony Stark. Hugo Weaving is confirmed as the Red Skull in the upcoming Captain America movie - This has been rumored for a while now but is finally official. Honestly, I can't think of a better fit for Captain America's arch-nemesis. While I am a Chris Evans fan, I have my doubts about whether or not he's the right guy to play Steve Rogers, but there is no doubt that Hugo Weaving will be a great Red Skull. Looking forward to this! Ron Howard set to direct big screen adaptation of Stephen King's Dark Tower series - This is also wicked sweet news. I have yet to get around to reading King's fantasy/western series, but I have read Marvel's graphic novel adaptations which have been quite good thus far. I can't think of a Ron Howard film that I didn't like, so this has me excited too. So I've never really been one to review music (and I don't really plan on making a habit out of it). Partially because my tastes tend to run a little harder than most people I have regular contact with, and partially because I've never been one to get too hung up on lyrics. If I like the tune or the beat, I'm a happy camper. 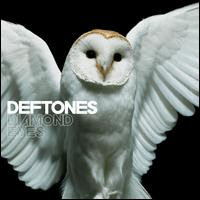 Having said that, I'm really digging the new Deftones album 'Diamond Eyes'. It actually releases tomorrow (May 4), but my pre-ordered copy came in today's mail (although I must admit, I've been enjoying a downloaded copy for almost two months now). 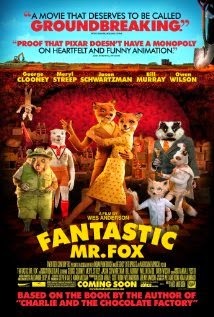 Fantastic Mr. Fox (2009), PG, 87 minutes - The past couple of months my NetFlix queue has bogged down. Seemingly everything that I want to see has been a new release to the home video market and as a result has popped up on my queue as 'a long wait'. Well, I've finally waited out the 'long wait' and the majority of my queue is available again so it's time to get back to burning through a couple NetFlix movies a week.